Cervenka Consulting is a recognised international expert in the nonlinear structural analysis with the emphasis on reinforced concrete structures. The main activities include the development of the commercial software ATENA for the computer simulation of real behaviour of RC structures, software distribution and technical support. Furthermore, the company provides consulting services and research for the industry leaders all over the world. Typical consulting projects involve the simulation of complex structural solutions, optimised design, reliability assessment and forensic investigation of structural failures. Our activities are world wide, with clients in 14 countries in Europe, America and Asia in design, construction, research, government and university institutions. We are devoted to providing top class and unique analysis solutions for buildings, bridges, tunnels, containments or fuel storage tanks. Containments in nuclear power plants (NPP) are designed to protect the reactor, related technology or shield the external environment against potential hazards. 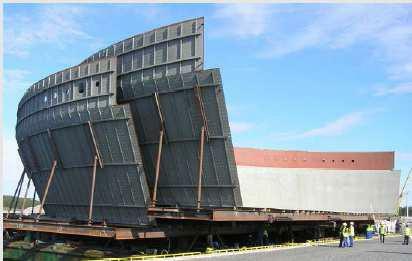 They are highly specialized structures, which must comply with demanding safety regulations of the nuclear industry. The nonlinear analysis provides a unique possibility to verify the structural performance under extreme loading scenarios. This is when our software ATENA is becoming a popular choice for the structural engineers. It is based on the finite element method and validated material models for concrete steel and their interaction. Over 350 clients use the software worldwide. Our highly qualified team at Cervenka Consulting develops ATENA and supports its users all over the world. We are continuously testing its results with international benchmarks and round robin competitions (winner of Toronto 1984 competition, best strength prediction in Zurich 2005 competition). Figure 1 The newly constructed nuclear power plant Olkiluoto 3 in Finland was also analyzed with ATENA. Figure 2 The behavior of this containment steel liner at Olkiluoto 3 was also verified with ATENA software. The technology developed at Cervenka Consulting and the experience of our engineers is currently being successfully applied in several projects related to the nuclear industry. These projects include Temelin NPP in the Czech Republic, Olkilouto 3 NPP in Finland, Bhabha Atomic Research Center in India. ATENA software is illustrated on several selected examples from these projects. It should be mentioned, that in most cases, the confidentiality of such projects does not allow a disclosure of all relevant information. Therefore, only selected non-confidential data are presented here. 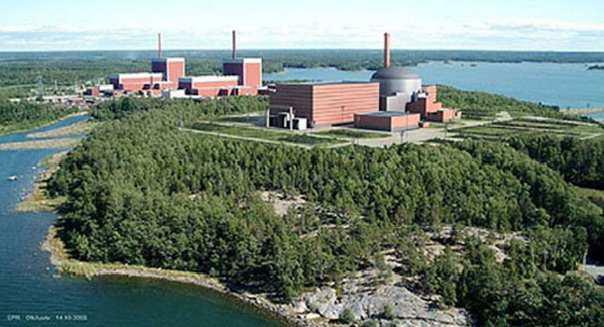 The new power plant in Finland shown in Figure 1 is delivered by AREVA, French supplier of modern nuclear technology solutions. Our team at Cervenka Consulting helped AREVA engineers to perform verifications of the pre-stressed concrete containment under normal operating conditions as well as various accident scenarios due to the loss of coolant, elevated temperature and internal overpressure. ATENA is also used to assess the anchoring details of the liner shown in Figure 2 to check for plastic strains and to ensure its safe functionality. With ATENA the engineers can also model the complete containment as shown in Figure 3. In this case, it is a containment model built in the scale 1:4 by Bhabha Atomic Research Center in Indi and tested up to failure. ATENA models are shown in Figure 3. 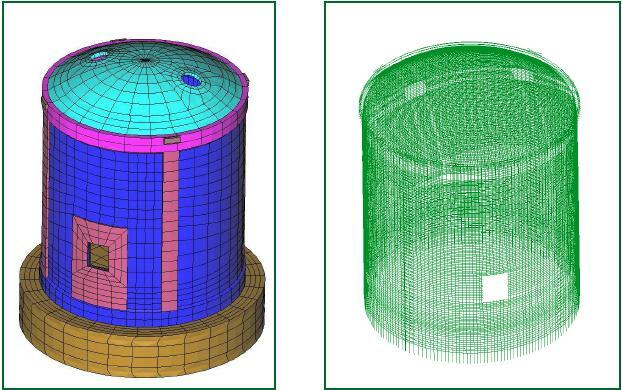 Thin parts of the containment vessel are represented by higher order layered shell elements, while some parts, such as joints and foundation are represented by solid 3D elements. 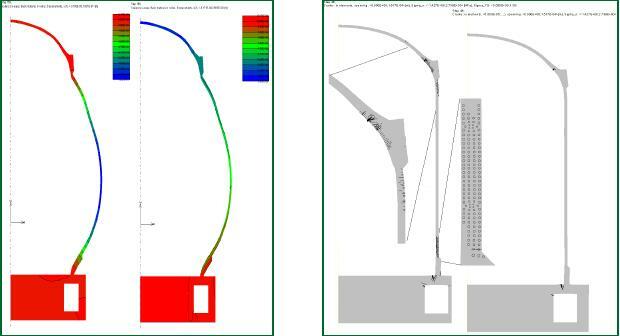 ATENA makes it possible to model very complex arrangement of the pre-stressing cables (Figure 3). Right: ATENA model of a complex cable layout. Figure 4 Example of ATENA results due to an internal overpressure. Left: Magnified deformed form of the containment cross section. Right: Unique crack visualization by ATENA. The computer simulation of containments performed by experienced engineers with ATENA software provides high-valued results for the verification of the containment design. Its efficiency has been proven through many years of consulting work in the field of numerical analysis. The quality control and management of Cervenka Consulting Ltd. is approved by ISO9001 certificate.